AQA chose Sisense for the enhanced user experience that allows restaurant companies to easily understand their data in addition to the robust BI analysis that provides the AQA platform unparalleled intelligence as compared to other food safety software platforms on the market. "For the first time ever in food safety history, restaurants will be able to stop food safety incidents before they occur, thus protecting their consumers and upholding brand reputation," stated Eric Graves, CEO of AQA. "Our partnership with Sisense is a strategic move based on our extensive experience as food scientists who clearly understand there is no margin for error when it comes to food safety." Historically, restaurants have struggled to access the mass amount of science-based information available from their supply chain. Sisense allows AQA's customers to quickly visualize this information to identify potential food safety and quality issues before product reaches the back of the house. "The future of food safety lies in proactivity and the prevention of food safety incidents," states John Laxson, Business Development Director at AQA. "With the integration of AQA and Sisense, tracing incidents after the fact will become a thing of the past." To learn more about Actionable Quality Assurance, visit www.actionableQA.com. To learn more about Sisense, visit www.sisense.com. 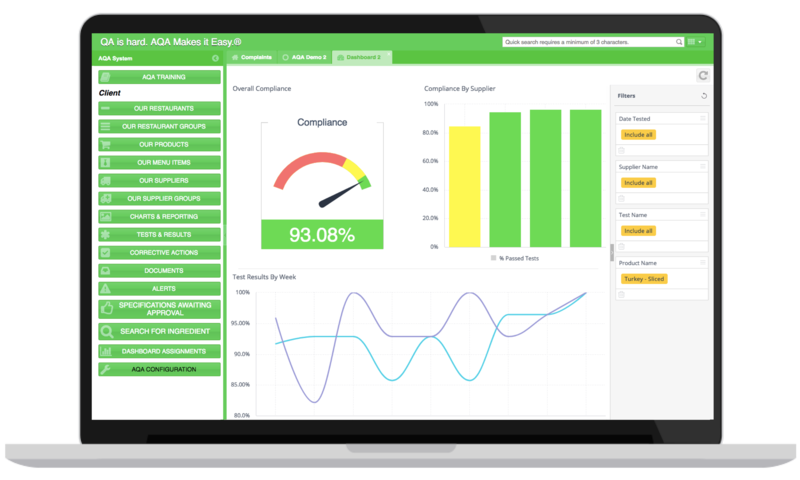 Actionable Quality Assurance (AQA) is a Software-as-a-Service (SaaS) technology company empowering innovative restaurant companies to control their food supply chain. Created by food scientists with a passion for improving food safety, AQA is the only software solution built specifically for the restaurant industry that prevents food safety incidents before they reach the customer and ensures a consistent guest experience through improved supplier performance. Learn more about Actionable Quality Assurance at www.actionableQA.com.